Sam Meacham is the director of the Centro lnvestigador del Sistema Acuifero in Quintana Roo, Mexico. 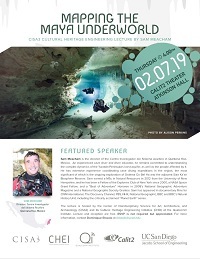 An experienced cave diver and diver educator, he remains committed to understanding the complex dynamics of the Yucatan Peninsula's karst aquifer, as well as the people affected by it. 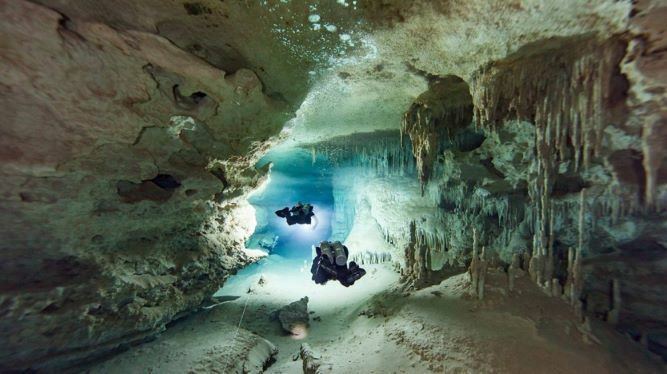 He has extensive experience coordinating cave diving expeditions in the region, the most significant of which is the ongoing exploration of Sistema Ox Bel Ha and the adjacent Sian Ka'an Biosphere Reserve. Sam earned a MSc in Natural Resources in 2012 from the University of New Hampshire, and he has been a Fellow of the Explorers Club of New York since 2000, a NASA Space Grant Fellow, and a "Best of Adventure" Honoree in 2008's National Geographic Adventure Magazine and a National Geographic Society Grantee. Sam has appeared in documentary films for CNN International, The Discovery Channel, PBS, NHK, National Geographic, BBC and BBC's Natural History Unit, including the critically acclaimed "Planet Earth" series. The lecture is hosted by the Center of Interdisciplinary Science for Art, Architecture, and Archaeology (CISA3) and its Cultural Heritage Engineering Initiative (CHEI) at the Qualcomm Institute. Lecture and reception are free. RSVP is not required but appreciated. For more information, contact Dominique Rissolo at drissolo@ucsd.edu.